No smoothie this time but if you need a holiday treat to take to a party, this one is easy peasy and super delicious! 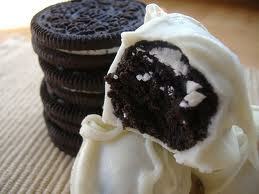 Put cookies and cream cheese in food processor Blend until a ball forms. roll dough into 50 balls. Refrigerate at least 2 hours. Melt candy coating, dip balls into chocolate and place on wax paper to dry. This entry was posted in Extras and tagged cream cheese, dessert, food processor, holiday treat, oreo, oreo truffle by wickedgreensmoothies. Bookmark the permalink.